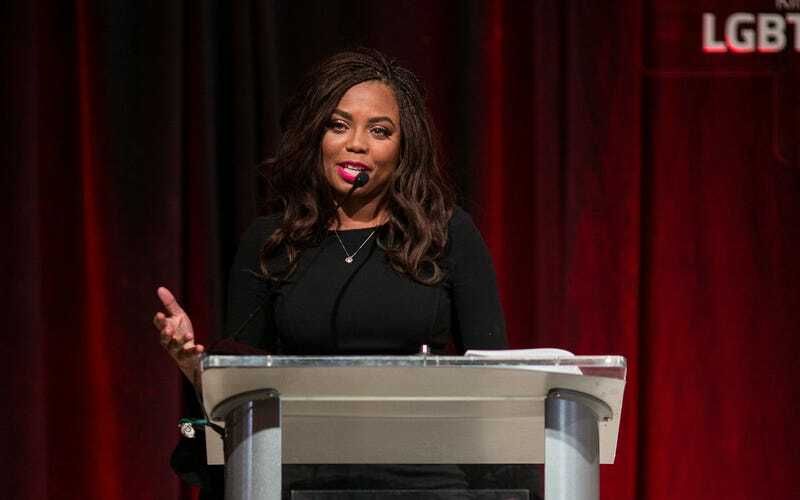 I won’t lie—It didn’t sit well with me when ESPN sports personality Jemele Hill issued a statement saying she “deserved that suspension” following the social media backlash over her controversial tweets about President Donald Trump and Dallas Cowboys owner Jerry Jones. I absolutely get that jobs are scarce and nice checks for those who truly “started from the bottom, now we’re here” are extremely rare. But sometimes, wanting to stay out of the unemployment line can go too far. Just think about how many people you know who have checked out at their jobs because it’s just easier to go along to get along. So when I attended the Atlanta Hawks’ diversity-inclusion symposium, MOSAIC (Model of Shaping Atlanta Through Inclusive Conversations), last week, I really expected Hill to continue walking the “just trying to keep my job” tone of her statement. In my experience, many companies do these events just to look like they’re doing something. Rarely are real issues even touched. The conversation usually reinforces what companies want to hear and not what employees of color—black employees especially—really experience, which is everything but diverse and inclusive. Plus, given MOSAIC’s origins, I just didn’t expect to hear anything out of the norm. Today there’s a new ownership group with former Duke and NBA player Grant Hill as a partner. Plus they hired Nzinga “Zing” Shaw, as the NBA’s first-ever chief diversity and inclusion officer. They’ve also put on MOSAIC annually since 2016, and for this third year they tapped Hill to give the keynote address with “Disruption” as its theme. Kicking off her address, Hill joked about spending time in Belize and zip-lining for the first time before easing into the White House calling her “Donald Trump is a white supremacist” tweet “a fireable offense” during a press briefing, backed by the man himself on Twitter, of course. And in case there is anyone who thinks that no one is still riding for Trump, Hill made it clear that they are by sharing details of the snail mail of hate she received along with the social media abuse. “I got called the n-word so much that I thought it was my middle name,” she candidly revealed. In Atlanta, Hill reiterated that the suspension was justified, noting that “ESPN is in the business of sports” and “not in the business necessarily of being construed as a political organization and I put them firmly in those crosshairs.” She also insisted that it was her decision to leave SC6 and join ESPN microsite The Undefeated to resume her writing career, with hosting TV specials and even creating her own video content as part of the deal. My worst fears about Hill giving up the fight like so many others whose outspokenness resulted in hard consequences seemed confirmed until she switched it up. As she took on the topics of disruption, diversity and inclusion, she spoke directly to those in hiring positions, who are still overwhelmingly white and male, informing them that people of color and women are experiencing this new old America in ways they can’t even begin to imagine. “In whatever business that you’re in, especially if you’re a woman and you’re a person of color, there’s a level of vulnerability that you feel right now that may be hard for everybody to relate to. You feel a little scared and under attack right now under some of the current policies and tone that our country has taken,” she said. Because you can talk a lot about wanting us at the table, but will you listen to us once we’re actually in the room? Will you groom and mentor us the way you would somebody that looks like you? Will you invite us to come play golf? Will you invite us out to drinks so that we can network with key people? Will you recommend us for assignments that challenge and grow us? Will you promote us? Fast-track us? Treat us like franchise players and not just sixth men or sixth women that are on the bench? Will you give us credit when we deserve it, even it means that you get a little less credit? When you start disrupting what your organization looks like, when it starts changing, and it’s very emblematic of what’s happening in this country right now, when the progressiveness gets a little too fast for people, a little too uncomfortable, when they start thinking that someone else’s ascension or having different people in the room is going to mean less for them, then you get the blowback, then you get the brushback, and then you get the criticism, and then you get people who are angry and mad at you, and you have to make that decision in that moment: Am I here to support the people who are mad over really nothing, or am I here to support the people who have never gotten this opportunity or rarely get it? One of my colleagues, who has seen Hill speak since this whole “Trump is a white supremacist” water-is-wet nonscandal, chastised me for even doubting the “Detroit vs. Everybody” native. So don’t let the headlines sway you as they did me; please know that Hill is still spitting pure truth about what’s really going down for us in this country.